This plugin is compatible with ONELAN, Windows and Mac devices but in different ways. 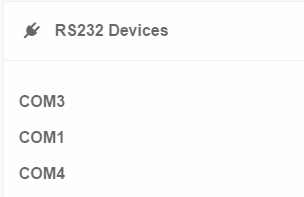 To activate the RS232 plugin on your account, please contact support via email. Default Port - This is the default COM port your device(s) will look to run the RS232 commands from. Can be overwritten in the devices page (more on this later). 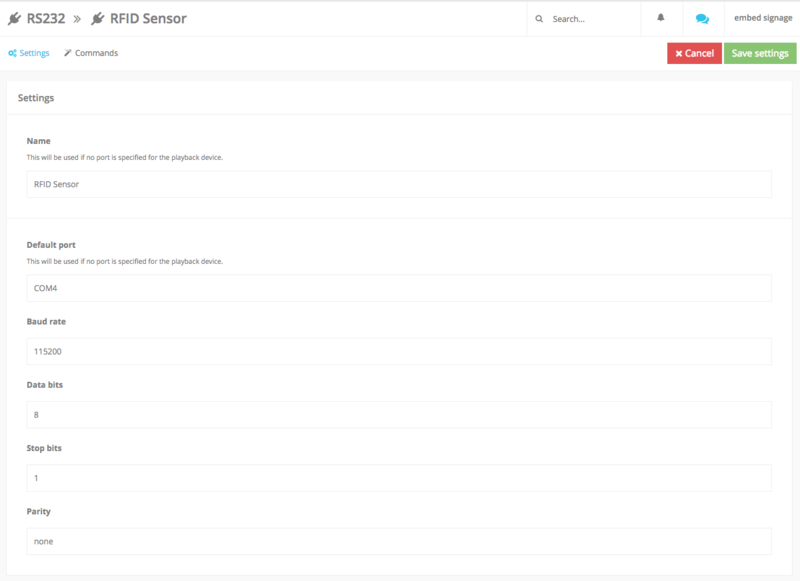 Next, with the RS232 RFID sensor example setup we can add some default commands. Click on the 'Commands' option and add the RS232 commands you want. Once you've added all the commands you want, click 'Save Commands'. With the RFID Sensor set up and commands set we can now go to the layout builder and start triggering content based on this RS232 setup. You can use this plugin and a variety of RS232 devices to trigger content - this is purely an example of how you can use it to set up a Lift and Learn / Place and Learn experience. First, let's add content to a zone so we know what we're going to be triggering. We've set all timings to 'Repeat' as we want the content to be triggered by the RFID Sensor via RS232 rather than the playlist item timings. You'll see in the RS232 Commands area of the playlist item you can start by choosing the 'Trigger' - this is the label and associated command we added in the RS232 plugin area earlier. 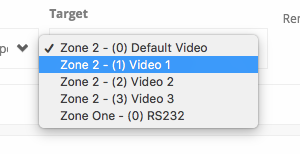 Note: If you want to add a new RS232 string (not yet added in the plugin area), you can do so by choosing the 'custom string' option in the trigger drop down list. In our drop down we have all the playlist items available on this layout. We will choose 'Video 1' to be activated. This now means that when Tag 1 is picked up from the RFID sensor, Video 1 will begin to play on loop. 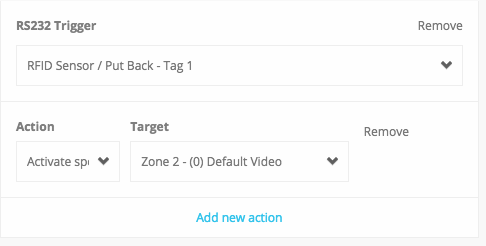 Now we can configure what we want to happen when 'Tag 1' is placed back on the sensor. Following the same steps but this time we set the Trigger to the 'Put Back Tag 1' label and its associated command that we set up in the RS232 plugin area earlier. 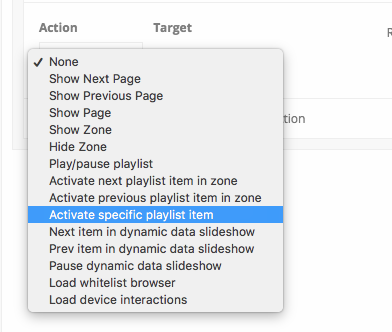 We again choose to activate a specific playlist item but this time we'll choose the default video. 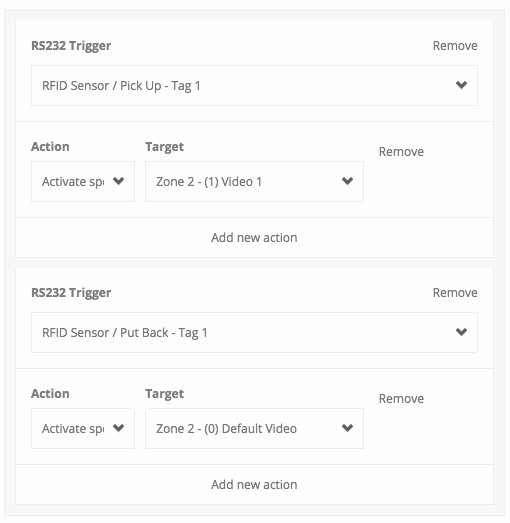 Once we're happy with our RS232 commands we click 'Finished Editing' the zone playlist and can now go an publish our content to a compatible Windows / Mac device with the RFID sensor connected via RS232 to start triggering content. This plugin can also be used with a ONELAN NTB subscriber to send on / off commands to a connected RS232 enabled display. Now we complete the settings information for the Display we wish to turn on / off. In our example we will use a Samsung DM48E display. We can now set up the RS232 commands. 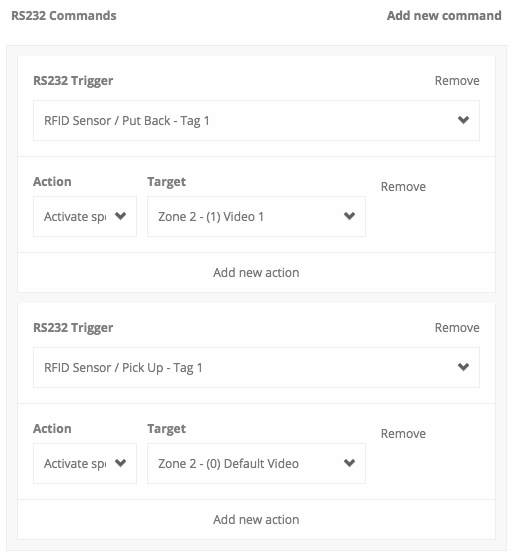 Click on the 'Commands' option and add the RS232 commands you want. In this scenario we have added the HEX strings for the Samsung DM48E on and off commands. 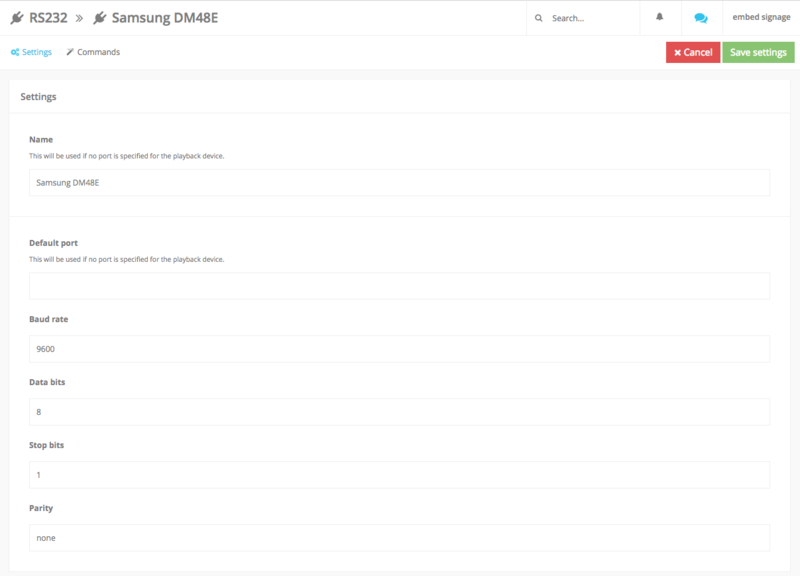 To associate these to a ONELAN device, we now need to go to the Device page and 'edit' the ONELAN NTB that we have connected to the Samsung DM48E display. 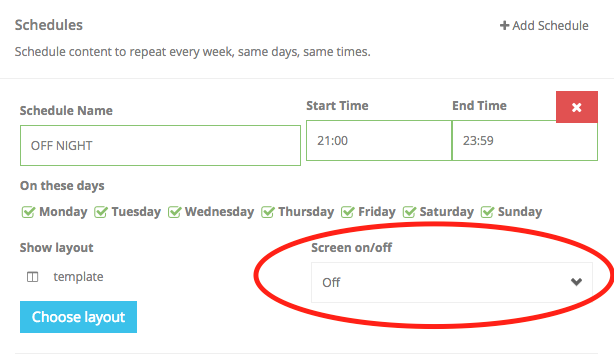 Now anytime you add a schedule to a channel and use the Screen on / off option the ONELAN box with RS232 configured will send those commands to the connected display.